What is the public opinion - is the administration is citizen-oriented or not? 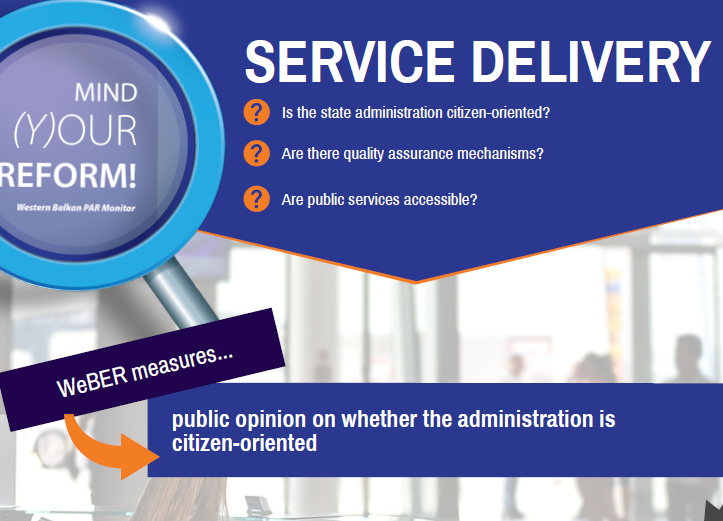 Can citizens give feedback on the quality of administrative services and is the feedback is publicly available? What do CSOs think about accessibility of administrative services? Do (and how) service providers publish information about offered services? Find out in this WeBER infographic. Download the infographic here. 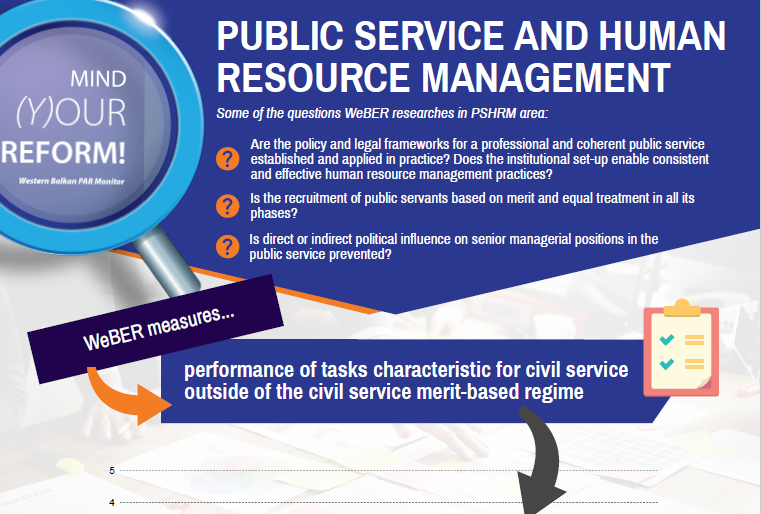 Are tasks characteristic for civil service performed outside merit-based based regime? How open, transparent and fair is the recruitment into the civil service? How effective is the protection of senior civil servants’ position from unwanted political interference? Find out in this WeBER infographic. This policy brief aims to present the main results of the frst monitoring cycle which covers September 2017-September 2018. WeBER monitoring findings suggest that Kosovo performs best in the area of PDC and SD although the scores are average whereas worst in the area of SFPAR. Speciffcally, the overall results (in terms of total scores) show that compared to the other six Western Balkan countries, Kosovo ranks second only after Albania, leaving behind the leaders in the EU membership process, Montenegro and Serbia. Is Albania walking the talk? 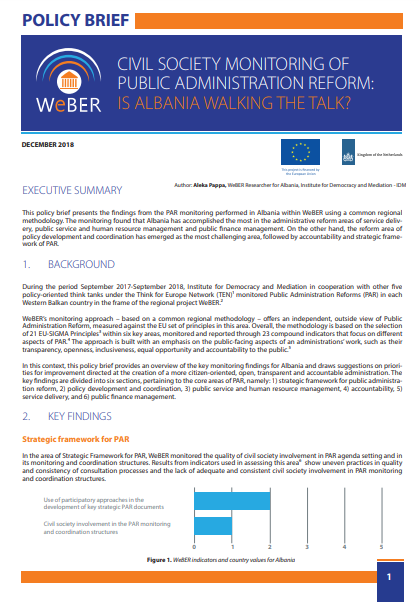 This policy brief presents the findings from the PAR monitoring performed in Albania within WeBER using a common regional methodology. The monitoring found that Albania has accomplished the most in the administrative reform areas of service delivery, public service and human resource management and public finance management. On the other hand, the reform area of policy development and coordination has emerged as the most challenging area, followed by accountability and strategic framework of PAR. 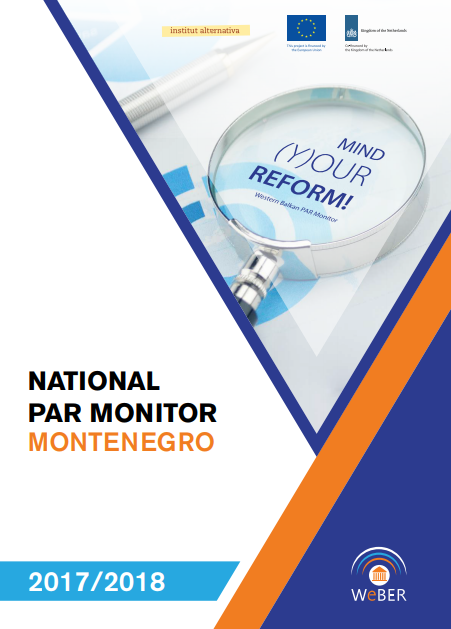 This PAR Monitor report, produced by the WeBER project, provides detailed monitoring results and recommendations for Montenegro, based on a comprehensive, year-long research focused on PAR. The PAR Monitor methodology is rooted in the regional approach. The design of all WeBER indicators enables comparisons between the administrations in the Western Balkans and allows for regional comparability of results. 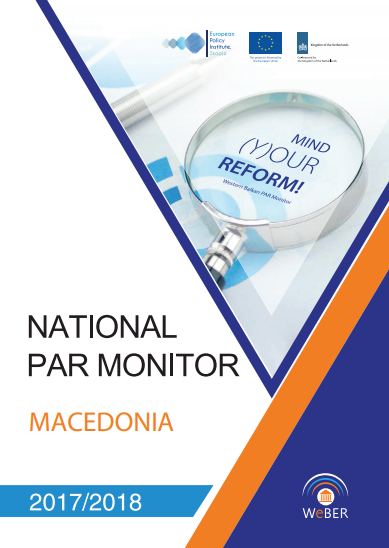 This PAR Monitor report, produced by the WeBER project, provides detailed monitoring results and recommendations for Macedonia, based on a comprehensive, year-long research focused on PAR. The PAR Monitor methodology is rooted in the regional approach. The design of all WeBER indicators enables comparisons between the administrations in the Western Balkans and allows for regional comparability of results. Find out in this WeBER infographic! Download the infographic here. 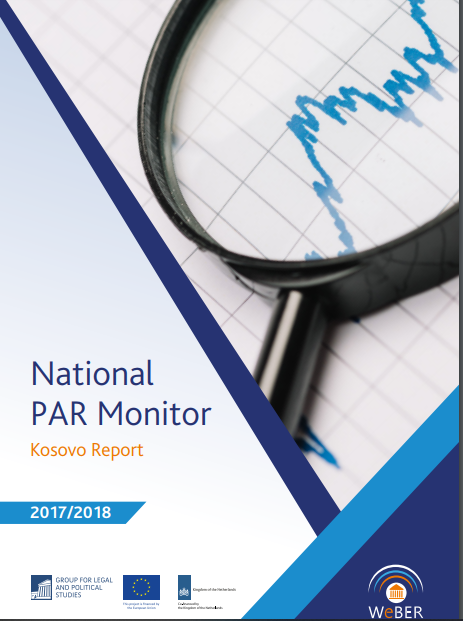 This PAR Monitor report, produced by the WeBER project, provides detailed monitoring results and recommendations for Kosovo, based on a comprehensive, year-long research focused on PAR. The PAR Monitor methodology is rooted in the regional approach. 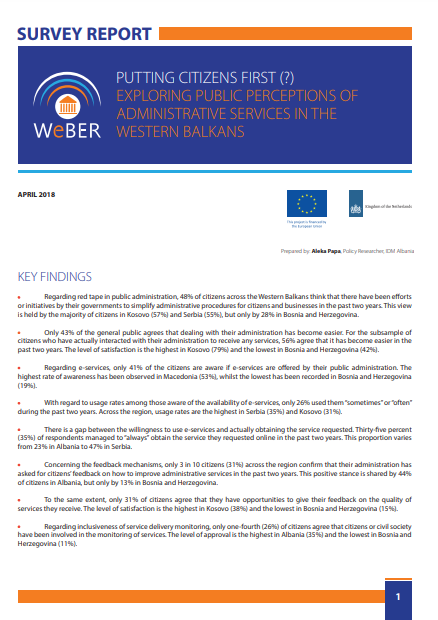 The design of all WeBER indicators enables comparisons between the administrations in the Western Balkans and allows for regional comparability of results. 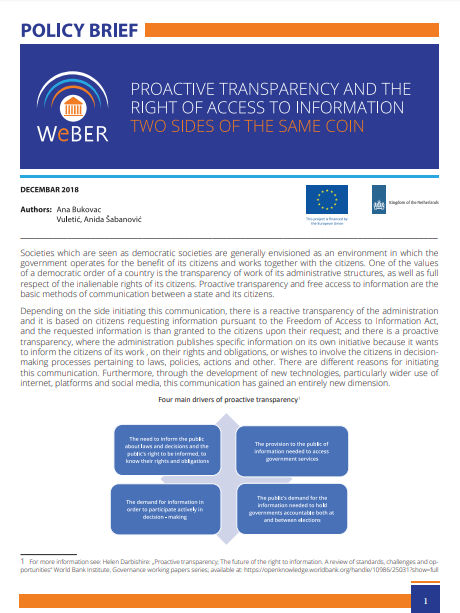 Depending on the side initiating communication, there is a reactive transparency of the administration in Bosnia and Herzegovina, and it is based on citizens requesting information pursuant to the Freedom of Access to Information Act, and the requested information is then granted to the citizens upon their request; and there is a proactive transparency, where the administration publishes specific information on its own initiative because it wants to inform the citizens of its work, on their rights and obligations, or wishes to involve the citizens in decision-making processes pertaining to laws, policies, actions and other. 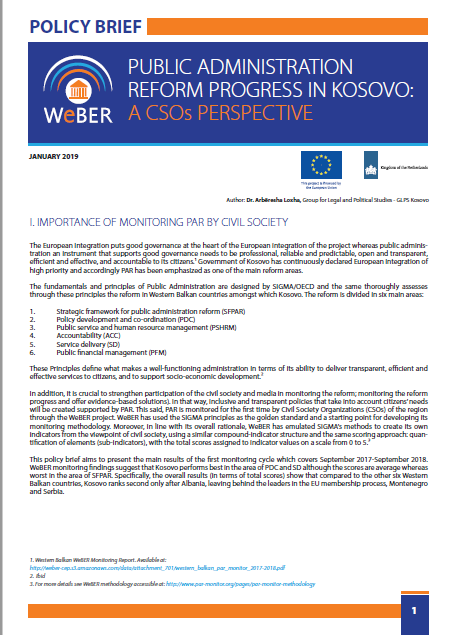 Preparing for accession negotiations in the Republic of Macedonia: What can we learn from WeBER monitoring? 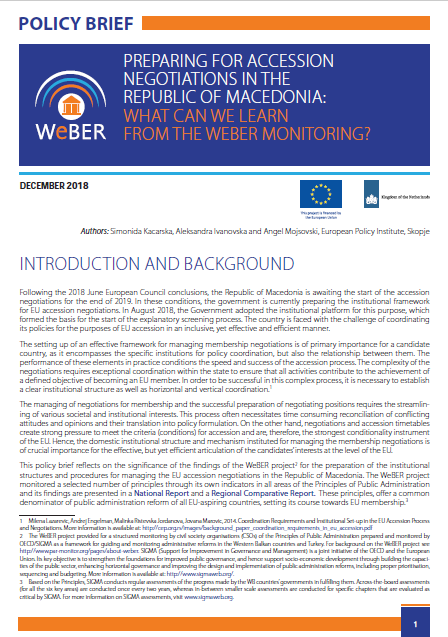 This policy brief reflects on the significance of the findings of the WeBER project for the preparation of the institutional structures and procedures for managing the EU accession negotiations in the Republic of Macedonia. 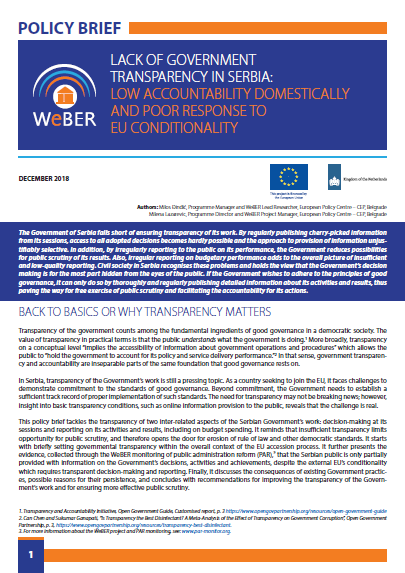 The WeBER project monitored a selected number of principles through its own indicators in all areas of the Principles of Public Administration and its findings are presented in a National Report and a Regional Comparative Report. These principles, offer a common denominator of public administration reform of all EU-aspiring countries, setting its course towards EU membership. 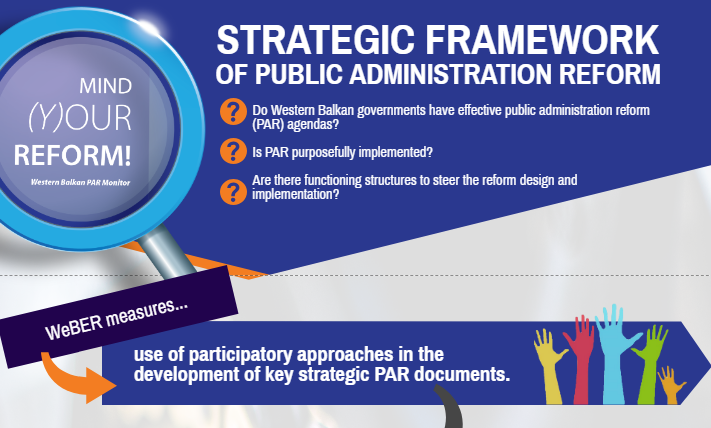 How often are participatory approaches used in the development of key strategic PAR documents in the Western Balkans? How regularly is civil society involved in the PAR monitoring and coordination structures? Find out in this WeBER Infographic! The Government of Serbia falls short of ensuring transparency of its work. By regularly publishing cherry-picked information from its sessions, access to all adopted decisions becomes hardly possible and the approach to provision of information unjustifiably selective. In addition, by irregularly reporting to the public on its performance, the Government reduces possibilities for public scrutiny of its results. Also, irregular reporting on budgetary performance adds to the overall picture of insufficient and low-quality reporting. Civil society in Serbia recognises these problems and holds the view that the Government’s decision making is for the most part hidden from the eyes of the public. If the Government wishes to adhere to the principles of good governance, it can only do so by thoroughly and regularly publishing detailed information about its activities and results, thus paving the way for free exercise of public scrutiny and facilitating the accountability for its actions. 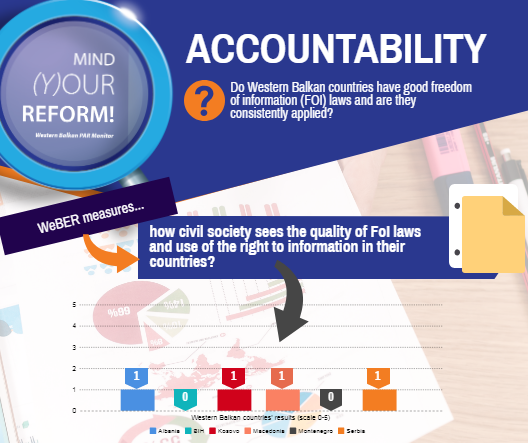 How civil society sees the quality of FoI laws and use of the right to information in their countries? Do and how authorities proactively inform the public? Coping with the EU decision-making: How are the Balkan countries preparing their policymaking systems for membership? High-quality standards in the development and coordination of public policy are always relevant in a domestic context but even more so in the framework of EU accession. Under the public administration reform (PAR) pillar of the European Union’s conditionality for the Balkans, the EU puts a strong emphasis on the improvement of the aspirants’ policy development and coordination practices. Independent monitoring suggests that the region’s governments currently display a low level of preparedness in the sphere of policymaking and coordination. Out of the broad PAR portfolio within the EU accession process, the area of policy development and coordination stands out as one of the weakest points. 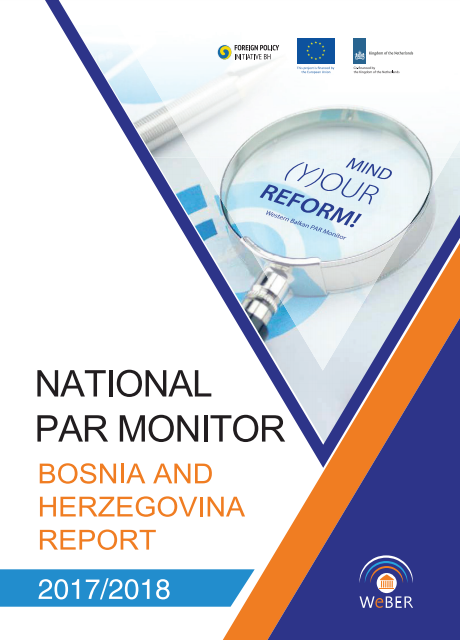 This PAR Monitor report, produced by the WeBER project, provides detailed monitoring results and recommendations for Bosnia and Herzegovina, based on a comprehensive, year-long research focused on PAR. The PAR Monitor methodology is rooted in the regional approach. The design of all WeBER indicators enables comparisons between the administrations in the Western Balkans and allows for regional comparability of results. 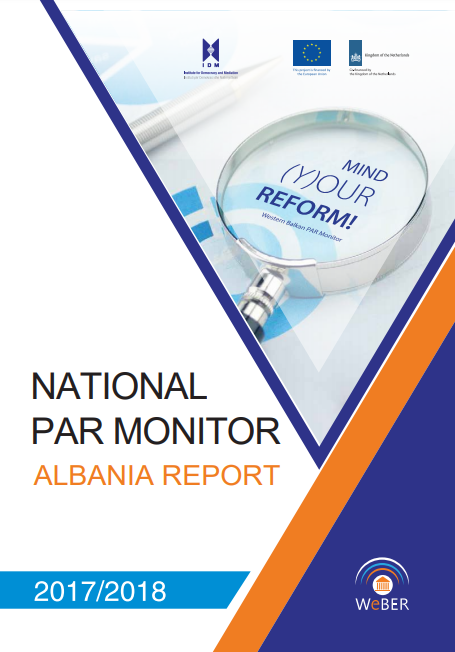 This PAR Monitor report, produced by the WeBER project, provides detailed monitoring results and recommendations for Albania, based on a comprehensive, year-long research focused on PAR. The PAR Monitor methodology is rooted in the regional approach. 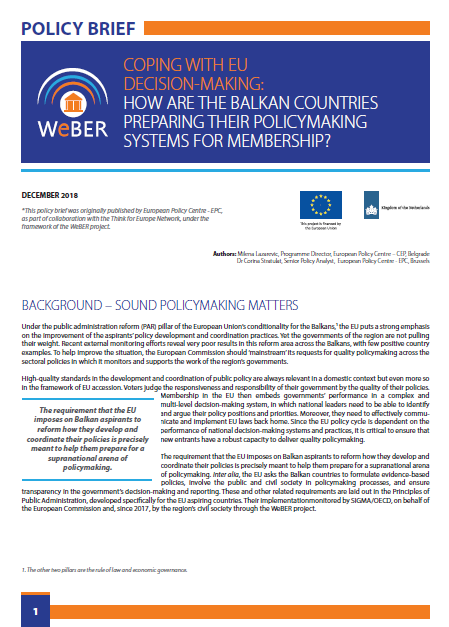 The design of all WeBER indicators enables comparisons between the administrations in the Western Balkans and allows for regional comparability of results. 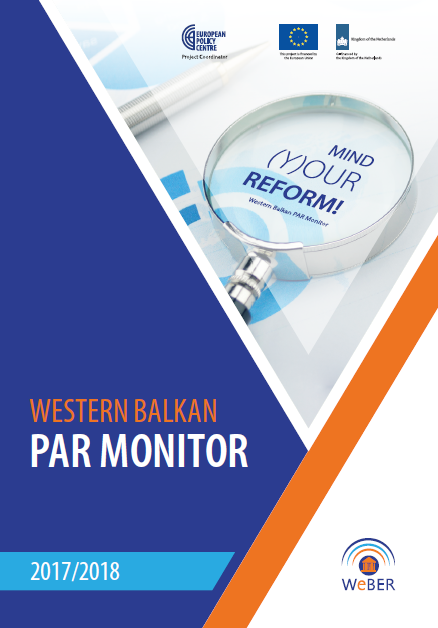 This Western Balkan PAR Monitor, produced by the WeBER project, provides comparative results for the entire region, based on a comprehensive, year-long monitoring research effort focused on PAR. It should be read in concurrence with the six national PAR Monitor reports, laying out detailed monitoring results and recommendations for each country. This document represents an Executive Summary of Western Balkan PAR Monitor. 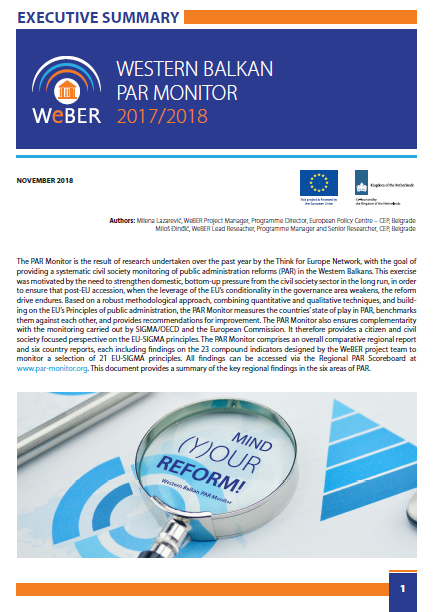 The PAR Monitor comprises an overall comparative regional report and six country reports, each including findings on the 23 compound indicators designed by the WeBER project team to monitor a selection of 21 EU-SIGMA principles. This document provides a summary of the key regional findings in the six areas of PAR. 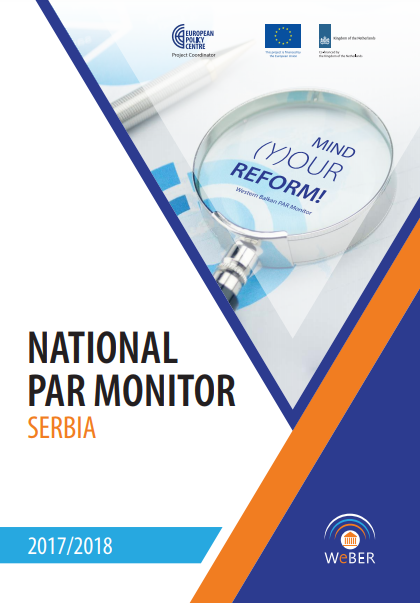 This PAR Monitor report, produced by the WeBER project, provides detailed monitoring results and recommendations for Serbia, based on a comprehensive, year-long research focused on PAR. The PAR Monitor adopts the EU principles of public administration as the main building block of the entire endeavour, to allow for regional comparability, peer learning and peer pressure. This also allows WeBER to guide the administrative reforms in the direction of compliance with EU standards and requirements. 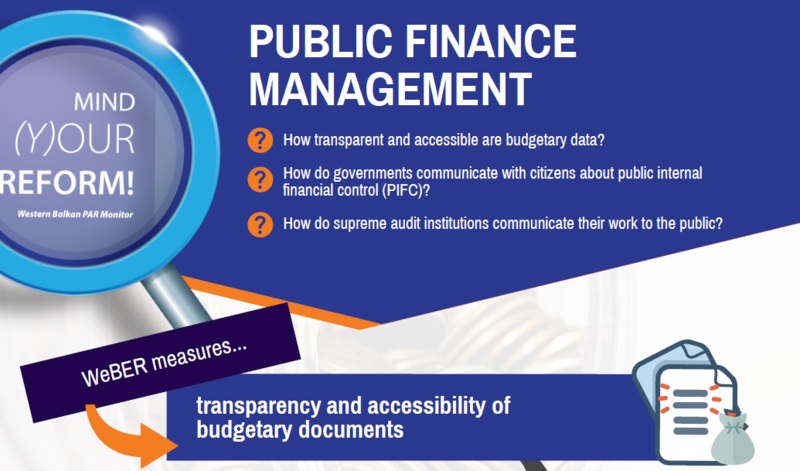 The WeBER monitoring focus also rests strongly on the citizen-facing aspects of public administration, particularly examining issues of transparency, information provision to the public, citizen participation, accountability, equal opportunity and integrity. Governments across the Western Balkans have made efforts towards improving service delivery; however, they are still unable to meet their citizens’ expectations of more accessible, transparent and responsive services. Part of the problem is that governments continue to typically design and offer services on the basis of their own requirements instead of taking into account the perspectives and needs of the citizens they serve. This report draws on a regional survey of 6172 respondents from Western Balkans aged 18 and older, surveyed in the second half of October and during November 2017 by using stratified three-stage random representative sampling. Its main aim was to explore perceptions towards the implementation of a citizen-oriented delivery of administrative services using the years 2015-2017 as a reference period. The main survey results are analysed below in four clusters: administrative simplification, e-services, feedback mechanisms of service delivery, and monitoring. Download the Survey Report here. 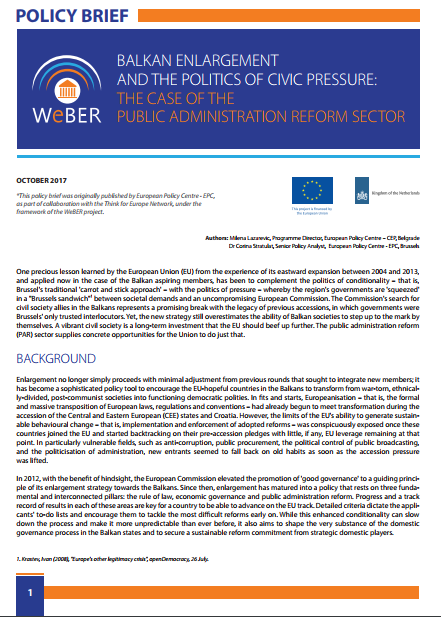 In this Policy Brief, Milena Lazarevic and Corina Stratulat review the origins of civil society involvement in the public sector reforms leading to a country’s accession to the European Union. The search for civil society allies represents a promising break with the legacy of previous accessions in which governments were the Commission’s only trusted interlocutors. This policy brief was originally published by European Policy Centre – EPC, as part of the collaboration with the Think for Europe Network, under the framework of the WeBER project. 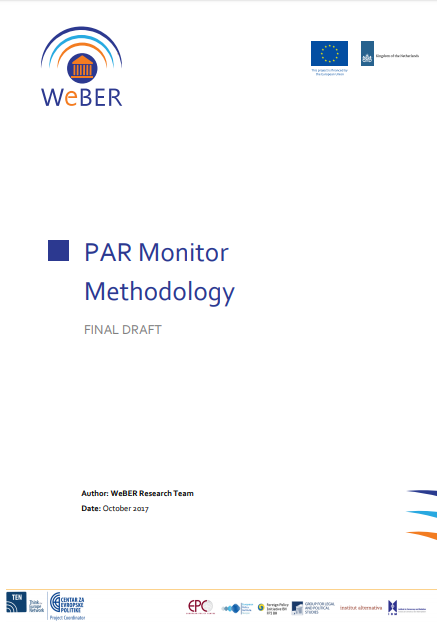 PAR Monitor is the cornerstone element of the WeBER Platform and represents a foundation for the activities within the Platform. Download the PAR Monitor Methodology here.